My name is Sam Enthoven. I write fantastical action thrillers for young people. 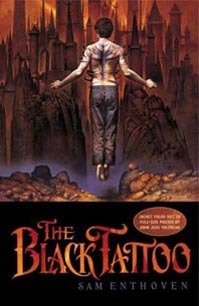 Welcome to theblacktattoo.com, the site THE WEBSPHINX and I have created to help promote my debut novel. This is [UPDATE: WAS-!] my first time in print after over ten years of hard work, and I have to say I'm rather excited. Bwah-ha! Bwah-ha-ha-ha! BWAH-HA-HA-HA-HA-ahem, er, sorry, excuse me. It's published by Doubleday, an imprint of Random House Children's Books here where I'm from in the UK (plus various other places!) and by Razorbill, an imprint of Penguin US. Non-English-language editions are also on their way in Spain, Germany and Portugal with more to come, I hope! Please feel free to click around the site a bit, you'll find some interesting stuff I reckon. 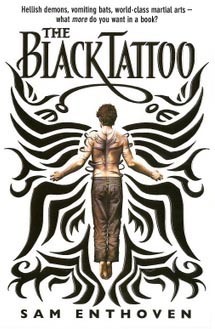 Regular news updates about what's going on with me and Black Tat. Exclusive DVD-style deleted scenes a demon cocktail party, an extra fight-scene and a couple of other fun things, to be unlocked by a special password hidden in the book. But that isn't all! THE WEBSPHINX and I have all kinds of MONSTROUS plans for the future, so do keep checking in. I'm so excited, I'm afraid I'm going to have to go and jump around the room like a gibbon for a while. Hee hee hee!